The Folio Prize Shortlist 2013; What Do We All Think Then? Now amazingly I had heard of all of them bar one, which is Red Doc by Anne Carson and is poetry so would be why it might be off my radar as I am not known for my poetry prowess. Amazingly I have also read one of them, A Girl is a Half Formed Thing is an incredible debut by Eimear McBride (who you can hear talking to me about it on You Wrote The Book) which is unlike any book I have ever read or am likely to read again. It’s a marvel. The rest of the list I have all heard of. Rachel Kushner’s The Flamethrowers has had a rather mixed response, people either saying it is the best thing ever or saying its completely overrated, I haven’t bothered with it shamefully because I don’t like either of the covers and think it has motorcycling in it which makes me inwardly groan. Maybe I should look into it more? Another book I was sent and didn’t read was Amity Gaige’s Schroder which I have no real reason for not reading, I think the cover (again, sorry) put me off as it looked like it might be a heart breaking tale of a child being abused or a father losing his daughter – no idea why the cover makes me think that but it does. Another to possibly find out more about? Jane Gardam and George Saunders are two authors I have heard wonderful, wonderful things about and have been meaning to read so I might just get my mitts on those in the next few weeks. I also own two of the other books which I have kept to read at some point. A Naked Singularity I do have on my shelves and am rather fascinated by because no one would publish it for ages, then it did quite well self-published before a small press did and then it exploded. I have held off because it’s HUGE, like mammoth, so maybe a book to take on holiday. Kent Haruf is an author I have heard the most wonderful, wonderful, wonderful things about and have three of his books which make the trilogy that Benediction finished so I am going to dig out Plainsong and read that pronto. I am not sure I will read all three before the winner is announced, but then again I am not sure when that is from all the reports I have read… so maybe I will, ha! 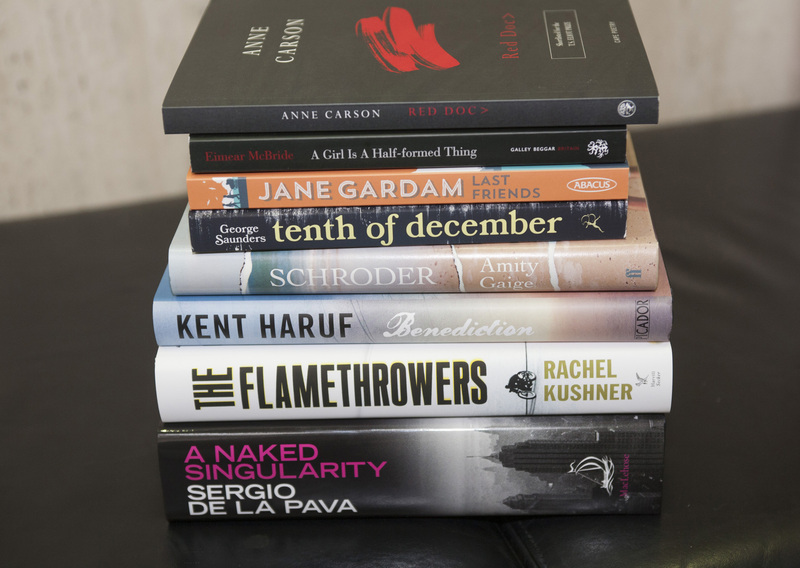 So what are your thoughts on the Folio Prize Shortlist 2014? Do you think it knocks ‘readability’ on its head? Which ones have you read and what did you think? Which should I make sure I read? Any thoughts on who will win? I have fingers crossed for Eimear as I think everyone should read that book! Let me know your thoughts. Tagged as Amity Gaige, Anne Carson, Book Thoughts, Eimear McBride, Folio Prize 2014, George Saunders, Jane Gardam, Kent Haruf, Rachel Kushner, Sergio De La Pava, You Wrote The Book!